Microwave fruit drying equipment is applied to drying, ripening and sterilization of black Cereals, soybeans, mung beans, corn, wheat skin, buckwheat, oatmeal, soybeans and peanuts.Drying sterilization seafood seasoning, sterilization, drying, puffing Tenebrio; rose, tea and other tea flower.Conventional thermo - thermal sterilization starts from the surface of the material, but there is an internal and external temperature difference through the heat conduction to the interior. In order to maintain the food flavor, shorten the processing time. 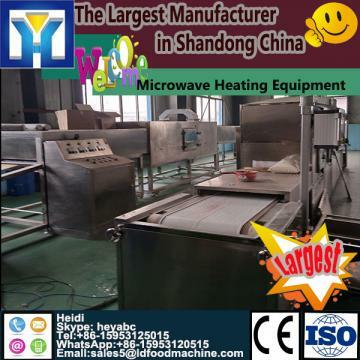 Microwave fruit drying equipment are widely used for drying and sterilizing powder,granular,flakes or colloidal form foods,nutritional health products,grain,agricultural and sideline products(rice,cornmeal),bamboo shoot,tea(wild chrysanthemum flower,broadleaf holly leaf,lotus leaf,green tea,black tea,puer tea),ginseng,mushroom,agaric,ganoderma,vegetables and fruits(spinach, carrot,parsley,onion,mango slice,apple slice,lemon slice,kiwi slice,banana slice etc),preserved fruits,red jujube,non-fired(oil saving)instant noodles,noodles,cookie,biscuit,rice powder noodles,chicken jerky,beef jerky,preserved meat,dried fish,seafood(seaweed,sea cucumber,laver,kelp,sardine,shrimp,abalone,etc),pickles,spices(pepper powder, Chicken essence, beef essence,pork essence,yeast extract,seafood extract,seafood soup fine,seafood soup powder, spareribs soup pure,pure,spareribs soup powder,spices,chili powder,ginger powder,garlic powder,aniseed,cinnamon,angelica,cumin,cassia bark,fennel etc),egg yolk powder,jam,a variety of small packaging and pet food mildew sterilization preservation.